Looking for options? This property may just fill the bill! Main home interior has been updated. New paint, lighting, fixtures, kitchen cabinets, and flooring. Full, unfinished basement waiting for your design ideas. 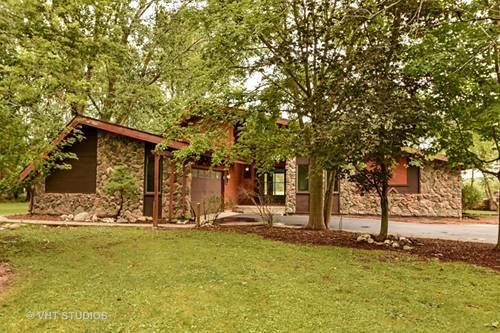 One level living, this ranch offers three bedrooms, two full baths, large great room with fireplace, large eating area in kitchen, plenty of counter space, huge pantry, and gorgeous views from every window. Just over ten acres, this lot has a pond, dirt bike course and over 2000 linear ft. of electric fence. Pole Barn with two bays, heated and extra finished rooms for a home business. Love horses? Want to share board for extra income? Barn with four stalls and tack room on property. Need space for guests, trainers, or looking for additional rental income? Double wide modular home on lot. Needs utility hook ups but has a nicely updated interior. The possibilities are endless here. Plenty of storage for antique cars, landscaping equipment, ATV's or boats. For more information about 26915 S Woodlawn, Crete, IL 60417 contact Urban Real Estate.